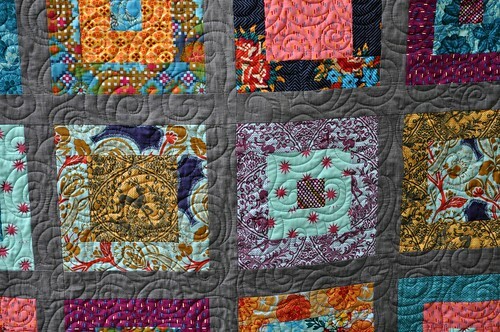 I finished up just in time to enter into the Blogger's Quilt Festival. 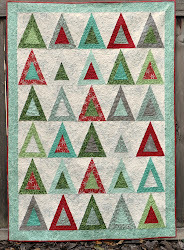 I hope you've been enjoying all the quilts this week! Thanks so much to Amy for hosting the festival again! This quilt is for one of my oldest friends, Shawndra, who I met in 9th grade soon after I moved to Provo. It's not my typical palette of colors but when we talked about what she wanted in a quilt, she said I could do whatever I wanted. And the saturated colors, mostly from the Anna Maria Horner Dowry line, remind me of her. 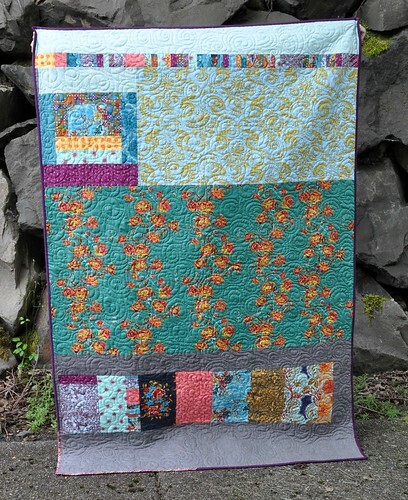 The back is pieced with a mix of leftovers from the front, a trailing rose fabric from another Anna Maria Horner line, and the blue and yellow damask was supposed to be included in the quilt top but it didn't quite match. I think it fits well on the back though. The binding is a dark purple with a section of Tula Pink dot fabric. I free motion quilted an allover swirl pattern. The quilting took 2 hours and 39 minutes and 3 1/2 bobbins. This quilt is made from my free Simple Squares pattern; it's the 4th quilt I've made with this pattern. It's a good one for large scale prints and goes together quickly. Thanks again to Amy, and don't forget to go check out all the quilts! 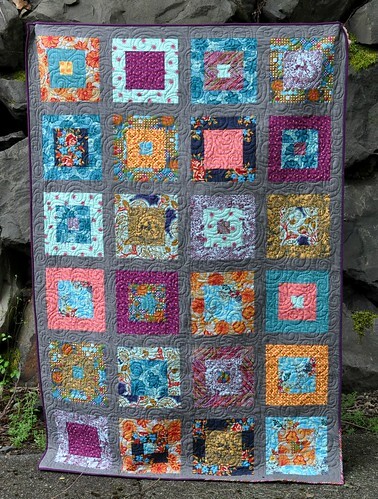 Such a pretty quilt! And I'm super impressed with your quilting time! I hope your friend loves it, because it is fantastic! Love the pattern!!! Very rich fabrics.